For the most part, Chrysler in the 1970s was a pretty grim story. 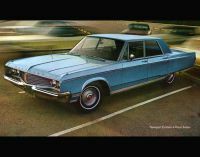 From the high-powered glory years of the Hemi and the 440 Six-Pack, Chryler soon slunk through a decade of Volares, Diplomats, and others not often worth remembering. But there is one whose story has rarely been told. Until today. Everybody knows the story of the original Charger R/T. 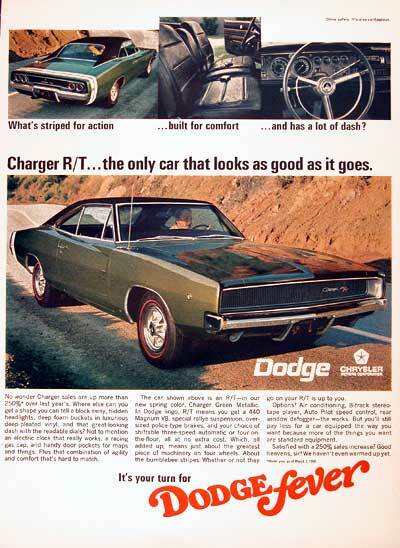 With a name taken (sort of) from Road and Track Magazine, the R/T was one hot Charger when it came out in 1968. But 1971 was the end of the line for the fire-breathing Mopar muscle machines. Or so everyone thought. When the high performance products were being phased out, the engineers working on them were transferred elsewhere in the company as their projects wound down. It was felt that Chrysler’s performance efforts had been so successful, that the men on that team needed to be dispersed to problem areas of the company in an attempt to export their winning attitude. One of them, Loren I. Edler, found himself transferred into the department in charge of station wagon tailgates. 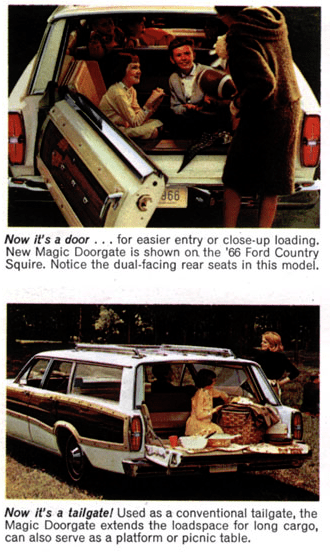 Everyone knows that Ford had been the 800 pound gorilla of tailgates for a decade, having pioneered the three-way doorgate. Even General Motors was displaying some tailgate mojo with the new clamshell models introduced on the 1971 B body wagons. Poor Chrysler was falling behind, and everyone knew it. Edler spend several days looking things over and trying to decide how to vault Mopar wagons into the same rarified bracket that their performance cars had inhabited. But it was a tough job. The full-sized C body cars had been new in 1969 and were due for a refresh soon, so Edler saw very little benefit to paying much attention to that class. The smaller B body wagon, however, was still pretty new. It’s three way doorgate was at least as good as Ford’s, so the mid-sizer seemed the place to start. One day, Edler was kicking around a dusty corner of the plant when he came across a forgotten case of R/T emblems. It was then that he knew what he had to do, and it had nothing to do with the tailgate. The days of the performance car might be over, but what about a performance wagon! Edler got to work. He knew that the engineering was a piece of cake, as all of the stuff they needed was already there. The emission-free truck 440, the mighty Torqueflite transmission, and all kinds of cool wheels and tires were all on the shelves and ripe for use. The all-important R/T badges completed the package. But this is when the truly hard work begun. In order for this to work, stealth was going to be necessary. Nobody from the government could know about this car, because there was no way it could pass 1972 emissions requirements. Not even upper management could be trusted. 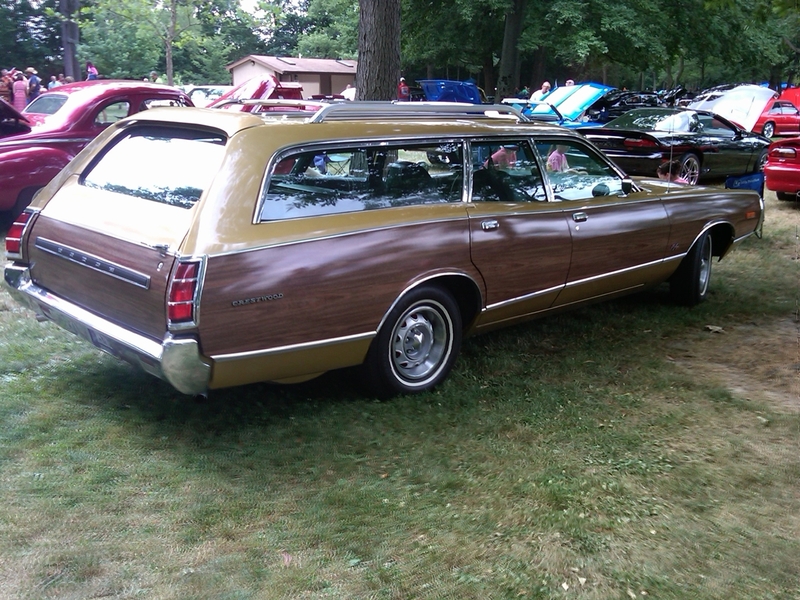 This car had to look completely like a standard Dodge Coronet wagon. Only that way would engineering be able to sneak this one out to dealers who were in the know for those special customers who were ready to do what it took to blow those assholes in their Malibu SSs off the roads. Nobody would suspect that a woody wagon named after toilet paper and toothpaste could be the hottest car in the land. Edler tried and rejected one idea after another for a code that the dealers could use to specify the R/T. At last, he had it: Color and trim! Nobody, but nobody would think to order a top line Coronet Crestwood with full wood paneling in metallic gold with green interior. It was sheer brilliance. With that single combination of checked boxes, the dealer could order the hottest car made, and nobody would be any the wiser. The only thing for the dealer to do was to take the pair of R/T emblems out of the shipping plastic in the glovebox and affix them to the front fenders. Everything was going beautifully. Enough parts were sourced from the replacement parts Division to create a high compression, premium gas terror from the 440 still made for trucks. Four prototypes had been constructed for testing, with most work being done on weekends to stay under the radar. If someone from management got his hat blown off by one of those gold woodie wagons, the program would be over, simple as that. 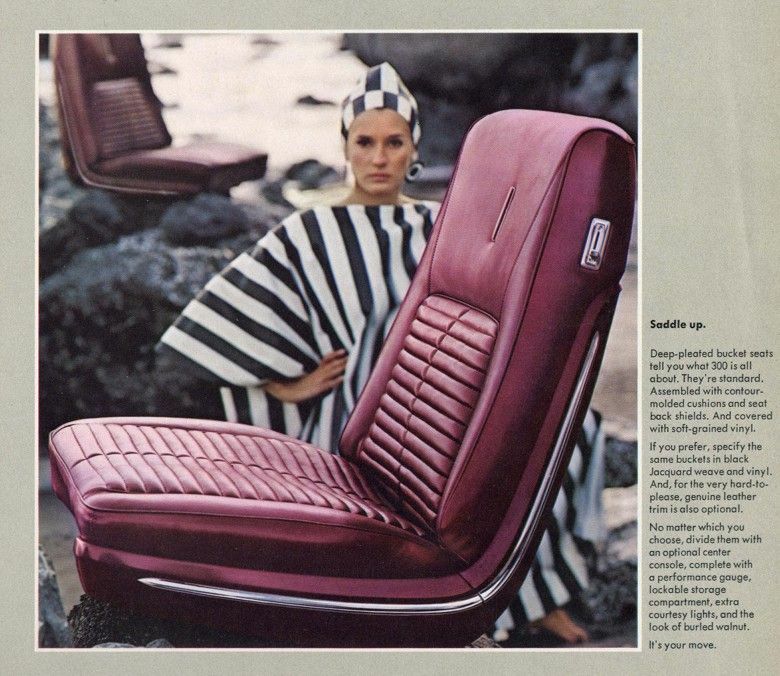 Only one thing could go wrong – It was still Chrysler, and it was still the 1970s. Edler had given specific instructions to everyone in the project that under no circumstances were the R/T emblems to be put on the fenders. These things were like gold, as there would be no more once the original stash ran out. To get them, three members of the engineering team had to sign off, one of them personally monitoring them being wrapped and put in the govebox, right under the owner’s manual. But the engineering guys were proud of their car. Just once, they said, let’s see one in the sunlight with the emblems. And so they did. Unfortunately, this was the same day that some functionaries from the EPA happened to be on site for an emissions spot-test of pre-production 1972 models. And one of them happened to be a car nut. “Whoa, what’s that. You guys building a new R/T?” And that, ladies and gentlemen, was that. Hell descended on Chrysler engineering that day. Lynn Townsend himself strode angrily into the office, informing everyone there that if the Company lost a single unit of production before the end of the month, there would be hell to pay. The program was scrapped, cars were crushed and people were fired. Miraculously not Edler. Chrysler’s personnel records, having just been transferred to a new record keeping system, had been completely corrupted, and Edler’s background on the performance team was among the lost information. Nobody in management figured that a lowly tailgate engineer could possibly have anything to do with a project like this. Chrysler engineering’s spirit was crushed that day, and their results for the rest of the decade showed it. Fortune would have one last laugh, however. Edler had driven one of the four cars home the night before the disaster. And wouldn’t you know, when it was time for work the next morning, the thing wouldn’t start. It would later turn out to be a simple ballast resistor. But Edler had used up his supply of spares and drove the wife’s Dart to work that day. With no paper trail, the Feds assumed that there were only three cars, because everybody does things in threes. And in Loren I. Edler’s garage, the lone Coronet Crestwood R/T would reside until Edler’s death in 2003. The car was eventually auctioned as part of the Edler estate. The present owner bought the car. He turned out to be the only bidder. 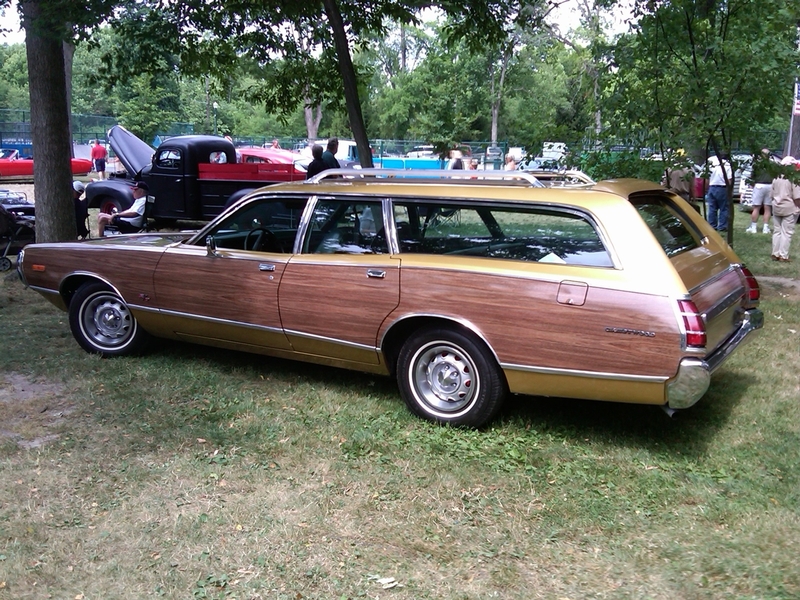 After all, who else would want a gold wood-paneled wagon with green interior? It was only after getting the car home that he went through the glovebox and found the R/T emblems. It took two years of research, but the owner (who chooses to remain anonymous) followed the clues and can now tell the story which we have just shared with you. He has carefully fastened those rare, original emblems to the front fenders, right where they were supposed to be. At car shows, people point at the R/T emblems on that wagon and laugh. The owner just keeps quiet and smiles. Which we trust you will do too. 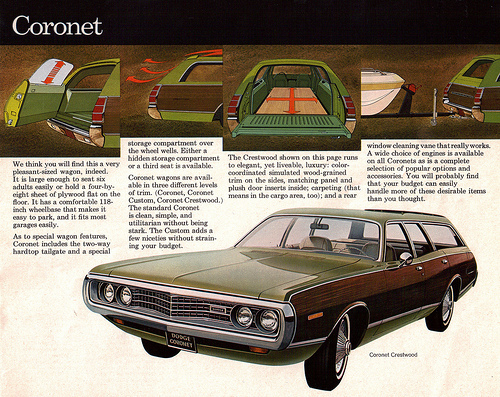 Regardless of any kind of “performance upgrades” (April Fool’s), it’s a very nice Coronet Crestwood wagon. Good to see someone had the sense to keep the care up on one of these. 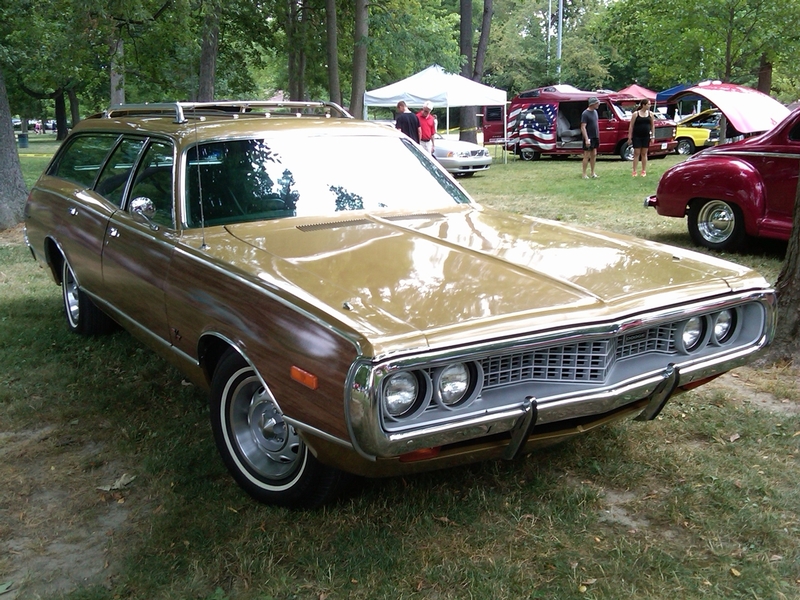 Most Mopar wagons from the ’70s were probably sent to the crusher a quarter century ago. One of the fondest memories I have growing up,was going with my dad to a local Dodge dealership on 12/09/72 to(long gone, Pioneer Dodge in Murray Utah) to take delivery of a forest green/w green interior, “73 Coronet Crestwood wagon. I was just 13I loved that car. 400 2bbl, torqueflite automatic. It had the 150 mph speedometer. Dad got it up to 141 on I-40 between Flagstaff AZ. and Albuquerque NM. he got nervous and backed it off,as it was starting to “float”. I have no doubt that he could have made the full 150,as he still had pedal left. It’s a good thing Mon never heard that story,but it was just the two of us on the trip. 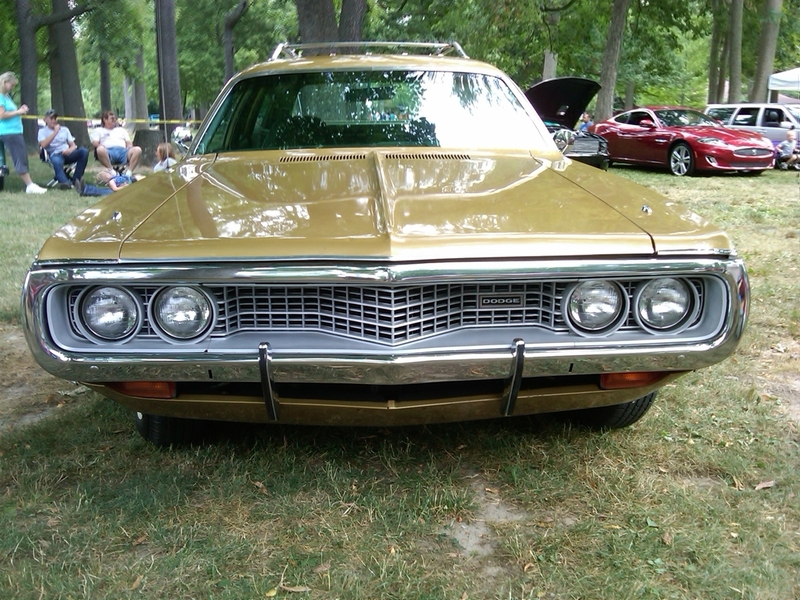 Our Mopar was identical to the car featured on the “73 Dodge wagons brochure. (as a matter of fact, I still have a pristine copy of that brochure).Even though both Dad and the wagon have both been gone for years, I still miss that car today,40 plus years later. I might be prejudiced, but I think the “73 Dodge Coronet Crestwood was also the best looking,comfortable, and one of the most powerful Mopar wagons ever made. I even have the “73 Coronet Crestwood brochure photo as my desktop wallpaper. Its a phony RT. I owned that car from 2002-2004 and it was a 318/904 car. Bought it at the 2002 Mopar Nats out of western Ohio and drove it home to southern New Jersey. Redid most of the car and sold in on Ebay in December of 2004 to a guy who lived on the upper peninsula of Michigan. I still have pictures of it from when I owned it. And for the record (and being actually serious), it was a very nice car! Obviously, we’re not going to get any real articles today. Cute, however. 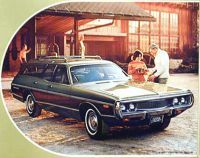 I had a ’69 Chrysler Land Barge Wagon in 1973 or so , it was a thirsty beast and had suffered badly under it’s previous owners but it always ran great after I replaced the balky fuel pump and I remember it fondly . American Station Wagons ROCK . Only brown diesel stick shift’s. “the 500-pound gorilla of tailgates”. Count me in if it has a three-on-the-tree! Sign me up, I’d take one. I suppose I could live with that colour combination. It would fly under the radar at the insurance company too. 🙂 Happy April Fools day. Reminds me of a white 1972 or ’73 Coronet sedan with factory 400 under the hood. Was for sale at a local swapmeet, appeared to be in excellent condition. Obviously a smog-era motor, but great potential for a sleeper. Jim, thanks for finally shining a light on the nefarious activities of tailgate engineers. For too long, these secretive fiends have subverted industry integrity with their swinging parties and unhinged behavior. Well-played, and almost completely believable right down to the ballast-resistor, I let out a guffaw when I saw that one. Haha, I was almost duped. Then I checked my calendar and figured something was off. Regarding the car: back in ’98 I remember asking my Grandma to buy me sort of an auto trader magazine which had nothing, but ads with pictures of the cars for sale. 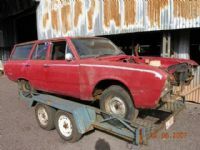 The cars were mainly the typical garden-variety stuff you could have found on the roads in Hungary in the late 90’s, but surprisingly, there was a Dodge Coronet Crestwood (spelled as “Christwood” in the ad, for some reason) Station Wagon for sale. According to the description it was supposed to be green, and was supposed to carry 9 people! It was something wonderfully different from the myriads of Suzukis, Opels, VWs and ex-Comecon junkers. Oddly enough, I remember two AMCs being offered for sale in that issue, an Eagle fastback and a ’77 Matador Wagon. At that sentence, I was on to you. 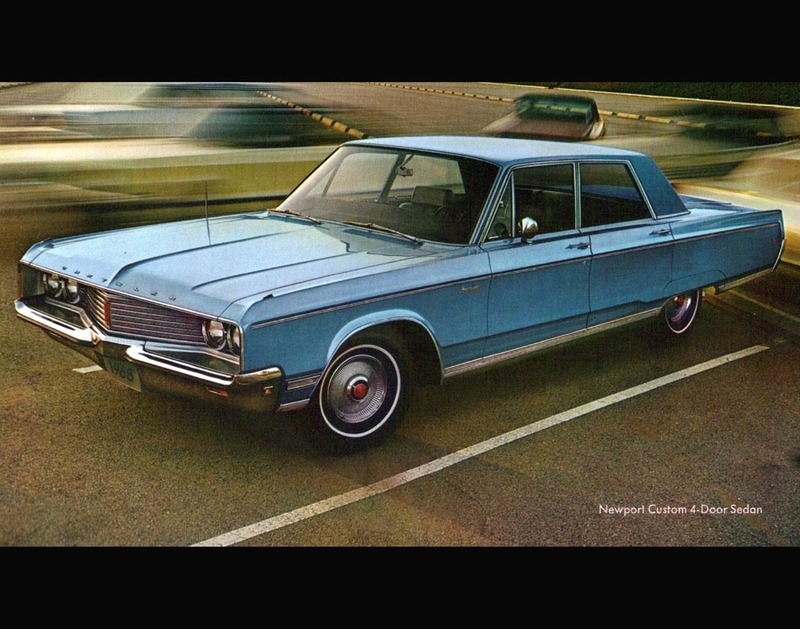 The early versions of these ’70s Chrysler B cars are actually pretty good looking in high level trim. Too bad the experience inside tended to be low quality. A solid launch with a more compelling product in ’71 would have made a world of difference when OPEC I kicked in during 1973. Chrysler’s tendency to move design cues between the brands is evident here. This Coronet carries a loop bumper version of the ’68 Chrysler Newport front end…. Boy Dave, you hit me where I live – I owned this exact model. Only mine was telephone beige with (gulp) 2 tone green interior. Maybe that was what scarred me for the gold/green combo on the subject car. That Newport Custom was one of my very favorites. But the color combo was simply wretched. How did I never notice that similarity before?! I always thought the ’68 C-body schnoz turned loopy as a deliberate foreshadowing of the ’69 fuselage look, which as we know changed the industry forever. Well, it’s still 4/1 for a few more minutes. My Dad would have loved one of those!!!!! I think a 360 V8 Diplomat wagon is an okay successor for this concept. It’s smaller, less powerful but still presentable as a performance wagon. 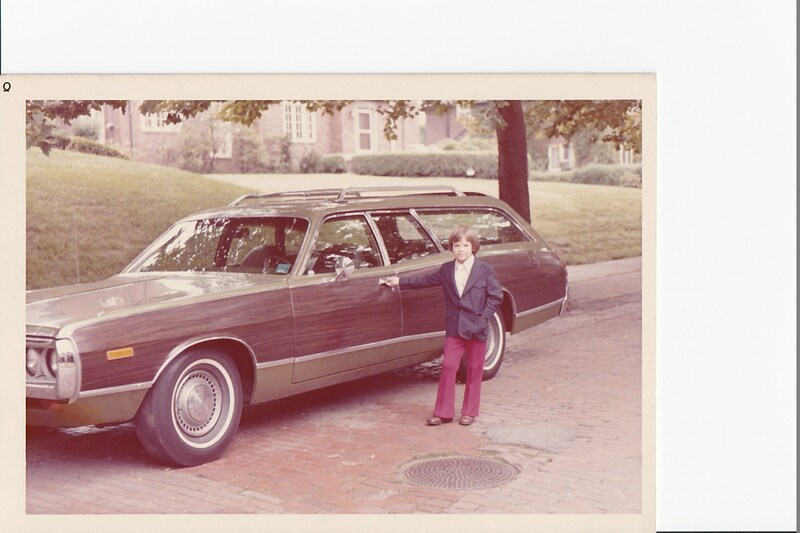 My brother bought a ’73 version of that wagon, in (what looked like B5) blue/blue interior__pretty sure it didn’t have the faux wood paneling, but I could be wrong. I was supposed to buy his ’68 Coronet R/T from him (this was B5 blue/white top & stripes, with black interior) when the wagon arrived at the dealership, in the fall of ’72 for $800.00, but I backed out and let him trade it in. On the bright side, an eighteen (18) year-old with that car probably wouldn’t be around to type this today! No joke (I’d tell you the same story yesterday or tomorrow)! April fools day joke or not, the idea of sharing the local Prius infested roads with this beast makes my sweaty hands tremble with anticipated pleasure. hehehe. I’ll take any story that features a wagon that gorgeous. On a slightly related note, it made me do a bit of a search on a model I’d heard of. In the late 60s, the Pacer was the performance spec Valiant here in oz. Many years ago I saw a classified for a VF Pacer WAGON. Didn’t believe it and later confirmed it to be a genuine very, very short run model (or more likely special order). There’s not much out there in internetland but for anyone interested…. Ahh. The R/T badge is not the only hint of this car’s proud heritage. There was a certain amount of paint left over from the famous Super Bee package. As a result of exposure to broughaming agents, this paint turned a color so repulsive that Ford had purchased it to make a special edition Maverick commemorating seasickness. But Edler and his team of renegades rescued enough to run a paint booth for a day. 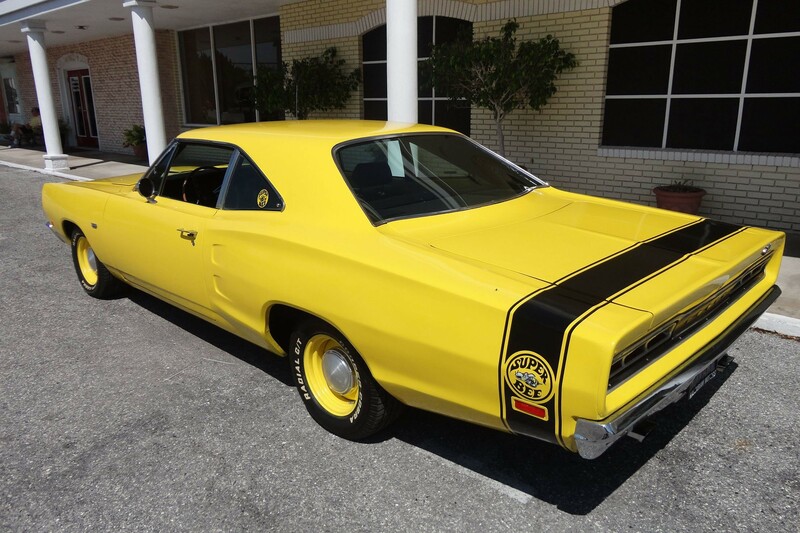 Although the broughaming epidemic that beset America was far from reaching its peak, the Michigan populace (and Chrysler management) had been so deranged by early exposure to broughmotoxins (e.g., Capricius Infer, Marquisia Maxima Culpa) that no one recognized the Super Bee yellow. 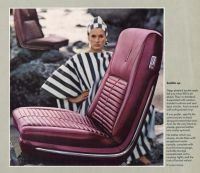 This article reminds me of the ’76 Córdoba my Mother chose for my Father to buy her, right there on the show room floor. An odd car! NO vinyl top, wire wheel covers, roll down windows, manual seat, but power door locks and a tilt wheel with cruise control, a classy dark metallic blue with Royal blue crushed velour bench seats with fold down arm rests. Underneath: the last of the Big Block 400 engines, 4 BBL Thermoquad carb, dual exhausts with no catalytic converters, 3.23 posi traction gears! This quiet, conservative “Small Chrysler” sucked the headlights out of every new Camaro Z-28 and Trans Am her 21 year old son (me) challenged to a stop light race. It quietly but menacingly rumbled like a ’69 Charger R/T. And when you floored it, the 727 TorqueFlite down shifted and the secondaries on the Thermoquad BELLOWED Big Block power! See, that’s a great story. It has everything but Ricardo himself, laughing at the poor Camaro drivers. Almost 40 years later and I can still see the pimply faced expressions of shock, surprise and finally disgust in my mind, after that “formal look” Mopar flat out “sucked the headlights” out of the “Muscle Car” that Mums & Daddums bought them for high school graduation presents! Mom sold the Córdoba to my next-to brother, who then sold it to my youngest brother. That was one tough car! Even my teenage kid brother couldn’t kill it’s high mileage self. You were the kid I wanted to be in 1976. I was stuck with my Mom’s pig of a 74 Luxury LeMans with a 2bbl 350 that couldn’t win a race with much of anything. Sadly, my mother’s 1973 Coronet was decidedly not and RT. But although you might beg to differ, it was a substantially better driver than the previous ’65. The 318 LA pulled harder than the old poly 318, despite the smog controls. And it handled better too; less extreme understeer. It felt better at high speed too; more planted down. The ’65 was kind of vague and mushy. The 318/TorqueFlite combo was a most under-rated powertrain combo. IIRC, “Popular Science” magazine reported that this was Mopar’s lowest warranty claim powertrain. My experience with the modern LA vs. the old Poly was the same. I have never driven one of those early B bodies, so I have no direct comparison. Could the 73 have had radial tires? That would have made a difference, and also age/mileage. But I don’t doubt you at all. True; I didn’t start driving the ’65 until it was 3-4 years old. The ’73 had Polyglass belted tires, but not radials. And it was brand new when I first drove it. 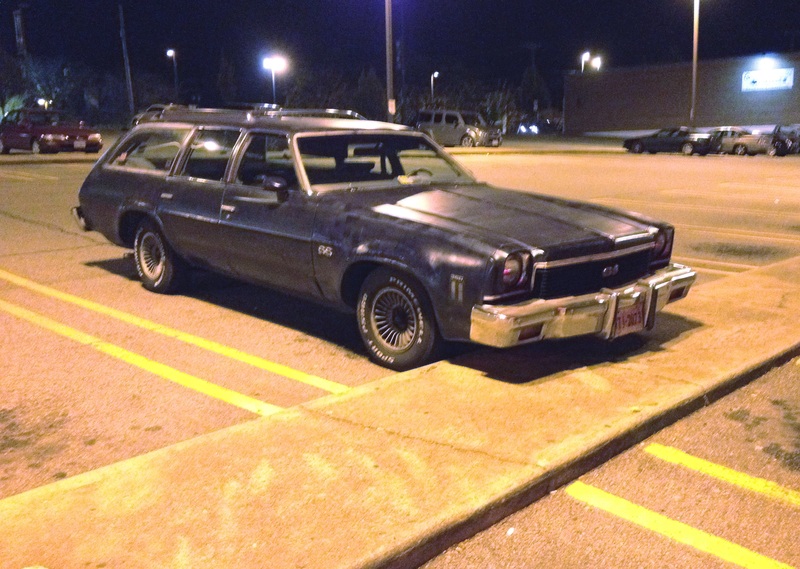 I learned the difference between radial & belted tires quickly when following my Aunt’s ’72 Torino station wagon, equipped with a new set of Sears Roadhandler/Michelin X radial tires. My ’73 Challenger Rallye, equipped with Mopar’s strong 340 4BBL/dual exhaust engine and G-60 series, raised white letter Goodyear Polyglass tires, had NO problem keeping up with her “Mom ‘n Pop” wagon on the curvy, two lane roads of southwestern Oklahoma. Then it started to rain….much to my bemusement and disgust, those skinny radial tires allowed her softly sprung Tornio to run off and leave me! She barely even (if at all?) slowed down. My macho, wide series, non radial tires Challenger was slippin’ & sliddin’ ALL over the black top road, TRYING to not loose sight of that radial tired wagon!! I quickly developed a high appreciation for radial tires that afternoon. Same here when in college, I put a set of (used, even) radials on my 71 Scamp. The Scamper had always been a fairly hard-riding car (after time spent in larger cars) but in the first 3 minutes of those radials, the car had never been so smooth and quiet. Then I made some turns, progressively faster. The car leaned over more than before, but those tires stuck to the road like glue instead of squealing and sliding as the bias plys I was so used to. I have never looked back. GALIN GOVER CERTFD. 1 OF ONE ROTISERIEE INVESTIR COLLECTIBEL HEMI CUDA 440 HEMI 6 PACK HEMI!!!!111!!!!11!! 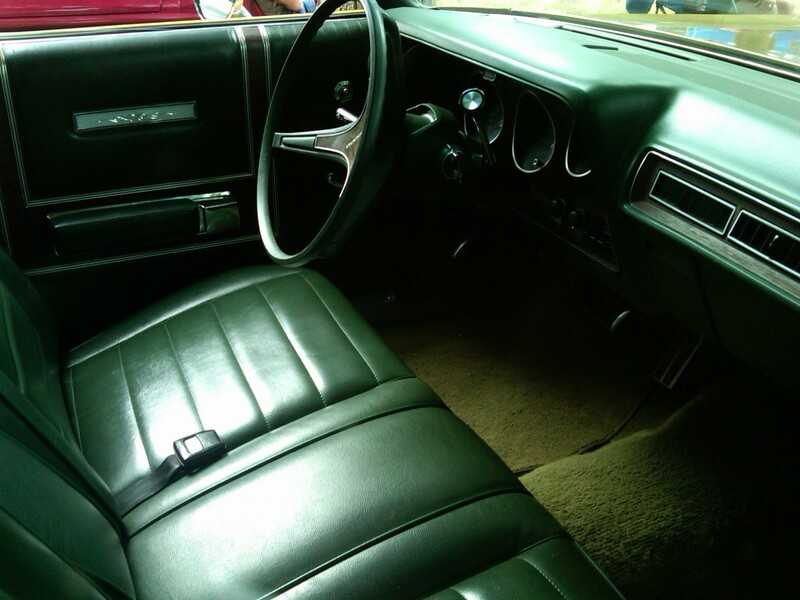 I still find this article car’s gold & green exterior/interior color combo quite “period correct”. From the first picture I was singing the Brady Bunch theme in my head. Nice long roof but that Chevelle or Malibu or whatever really got my attention! 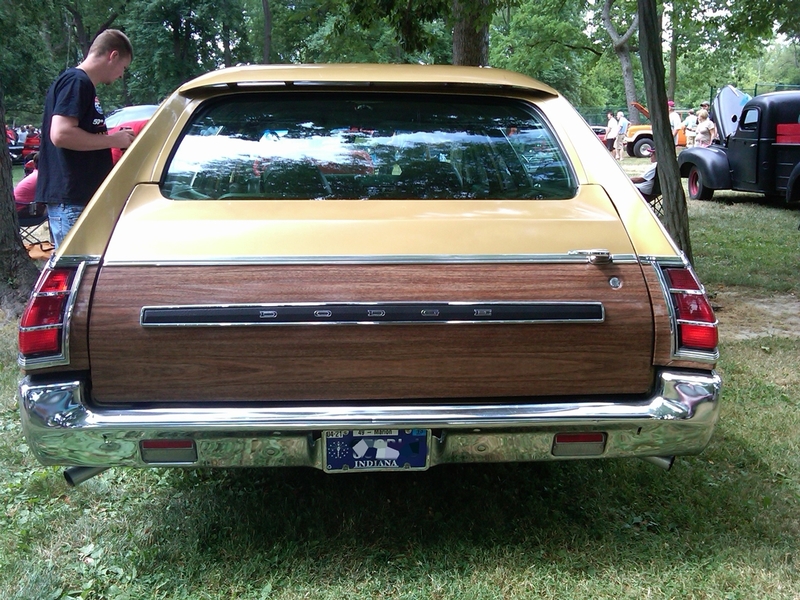 I loved that you picked the ’72 Crestwood. It was the Ur-car of my youth, so more modern than the ’68 Sport Suburban it replaced. Sherwood Green Metallic, with the high-back seats up front in either this green, or a lighter shade, and a 400 under the hood. For the avoidance of doubt, can you confirm that this car was really called Crestwood? Nice bit of fun. Any Corinthian leather? The Coronet Crestwood part is actually true. I don’t think I have ever seen a single Coronet with leather, Corinthian or otherwise. The mid-sized Chryslers were great products. Despite the lies and spin about the dreadful Dart and its ilk, the mid-sized Chryslers were as good as it got in that era; I’m a Ford guy and the Torino ended up being the Adele of the 70’s putting on the pounds each year. I slam the Dart because my family bought one new and it truly was horrific on all counts and that slant six wasn’t fit to be put into a clown – rough – noisy – and sounding like it would disassemble itself during the next mile driven. The 318 that Chrysler had was another story – it was classic and great and dependable. ravenuer on CC For Sale: 1987 Lancia Thema 8.32 – A Golden Opportunity By The Golden Gate?